It's a perfect combination of two-tone design! 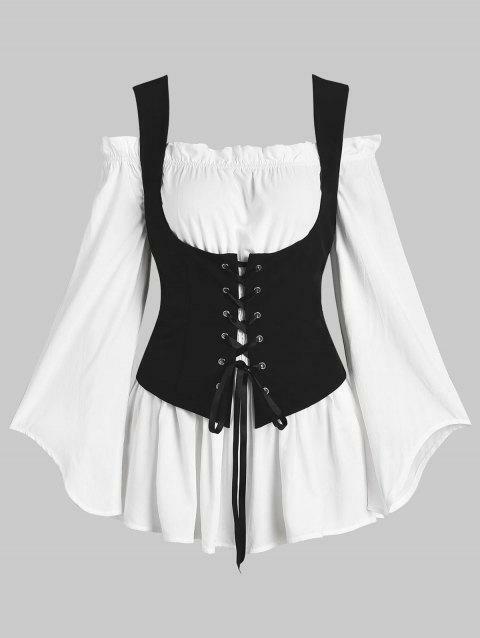 Looks so sassy with some classical vibes, the blouse features an off-the-shoulder neck with frilled trims, stretchy smocked fabric to slim the waist, and polished flared sleeves. And the matching waistcoat has an open bust design with front lace-up straps to adjust for the perfect fit. It's a great set for gals who looking for the slimmer waist. Flattering Fit & Great Color! Love this & it is very comfortable. I would definitely buy again. I'm actually thinking about buying one of the dresses, too. Love this top, reminds me of Vintage! I'm curvy, so I had to alter the front to create a more natural look , one less "stuffed" under the bunch of the elastic. Once I did that it fit great.